Chain at least 12 and add 3 chains for the first double crochet. Double crochet 3 times in each of the chains to make the "twist". Double crochet twice into the last crochet and slip stitch to complete. Leave about a 6-inch tail to sew onto any project or use as a bookmark. 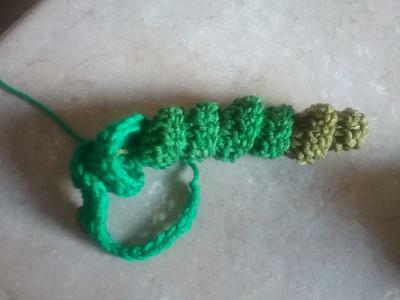 If using as a bookmark add a single crochet "tail" to the end as well as a tassle. Googly eyes can be added to the curly ribbon as well to make it a fun "bookworm".